Want to Learn About Growing Pumpkins? You've come to the right place. The process of growing pumpkins is relatively simple. They are easy to plant, easy to care for and easy to harvest. 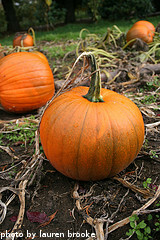 Different varieties produce different sizes and colors of pumpkins that can be used in a wide variety of recipes. They can also be used for carving and fall decoration. Some folks raise giant pumpkins and enter them in various contests. A properly cured pumpkin will keep for several months in the right environment. Pumpkins can also be canned or frozen. Pumpkins are usually planted by sowing the seeds directly in the garden when the soil has warmed in the spring a couple of weeks after the last expected frost. The seeds germinate in about a week when soil temps are around 70 degree F. They can take anywhere from 70-130 days to mature depending on the variety you are growing. Typically, small varieties mature must faster than large varieties. 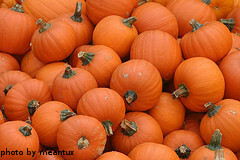 The sight of pumpkins usually invokes images of fall foliage, cool nights and Halloween. Pumpkins are classified as fruits. They grow on vines that thrive when sprawled out. Because the plants get so large, you need to make sure you have reserved enough space in your garden for growing pumpkins. Pumpkins are usually grown in traditional vegetable gardens. Although possible, because of their size, they are generally not appropriate for container gardening. Although all pumpkins are edible, some varieties have been bred specifically for high quality texture and taste. Other varieties have been bred for specific decorative purposes such as color and size. Pumpkins can range in size from about a pound to several hundred pounds. How you intend to use the pumpkins will dictate what variety you plant and when you plant them. Obviously, if you wanted to grow pumpkins to carve for Halloween, you would want them to mature before the first frost in late September to early October. If you wanted to grow giant pumpkins, you would plant them as soon as possible in the late spring because they take weeks longer to mature than other pumpkins. Pumpkins are delicious in both sweet and savory recipes. They can be the featured ingredient in soups, bread, cakes, pies, casseroles, etc... Additionally, toasted pumpkin seeds have long been a fall tradition.